When Dave and I were getting into electric planes, we flew a lot. Like, all the time. Too much, as it turned out, and I burned out and took a year off where I didn't fly at all. Dave had no such issue, and continued to fly every day. Every now and then he'd pester me to come out, but it just didn't grab me any more ... I didn't have the drive to go out there and practice hovering and "3d" flying, or to practice the more standard aerobatics of "pattern" flying. What lured me back? Dogfighting. That's really the kind of flying I always liked best anyway. The dogfights Dave and I used to do with the PCWs was fun, except we never actually made contact -- a PCW is too small, too fast and too erratic to be able to be able to hit another small, fast and erratic target with any regularity. What had been more fun was dogfighting our Pico Sticks, which were slow and controllable -- but also, unfortunately, fragile. The first contact between Pico Sticks usually means the end of the session, and what breaks most is the difficult-to-replace plastic forward wing holder. Either way, nobody else who flies around here seemed to have much interest in dogfighting. Anyway, fast-forward a couple years, and Dave and a bunch of his friends are dogfighting almost every day with lightweight wings, about 31" wingspan and 6-7 oz. That sounded like a lot more fun! Excuse me -- I mean they're "flying combat". I've been informed that "dogfighting" is a term to be avoided, since now it makes everybody think of Michael Vick and other people who illegally stage fights between real dogs. Me, I still think of biplanes when I hear the term. Anyway, whatever you call it, it's fun. The wings are light enough that they can fly quite slowly and fairly predictably (nothing like a PCW). Slow is actually good for combat -- it means that you can keep the planes in a small area, close to where the pilots are standing, which increases the chances that they'll actually hit each other. Because it turns out that hitting each other is actually quite difficult with R/C planes, even when you have a bunch of planes in the air and you're all trying to make contact. That's still a lot of sky volume compared to the size of the planes, and as anyone who's flown R/C knows, it's hard to tell exactly how far away your plane is even if you can see it in the other two dimensions. Although combat wings are light, they're also quite fast and maneuverable. They have brushless outrunner motors and great big elevons with high control throw. These things fly wonderfully -- you can do normal aerobatics with them too, but flip to high rates and give it some throttle and you can reverse directions in barely a wingspan. Part of why I like combat so much is that the wings are so beautiful to watch as they twist and dive. Now it's 2019 and the Wild Wing is no longer made. But that's okay. Today, there are tons of EPP wings, mostly sold as "FPV", or "First Person View", planes: they want you to build them big and heavy for slow and steady flight, and put a camera on them. But if you buy just the wing and not the camera rig, and build it light and fast, they're still great for combat. Don't bother with all the extra reinforcement, or covering the wing with tape; it's surprisingly unnecessary. I'm still flying my old Wild Wing, and I'm building a Teksumo as a backup. (I still have the Boomer, but EPP gets soft and brittle after a while and the Boomer can't take a hit the way it used to.) Dave is flying a Zorro, pictured at left with a chunk out of its right elevon from a spat with my Wild Wing's prop earlier that day. They both continued flying after that hit, and we only noticed the missing elevon chunk after it landed. Here are some videos of a combat meet we had in '08 at Sunnyvale Baylands. Pete's blog also has some good combat movies, like this one of ten wings in the air at once. The plane at the top of this page is based on a much-modified "Wild Wing" kit. She's named "Notch", after my favorite squirrel, because of the notch in one vertical stabilizer, a souvenir from someone's prop during her first big battle. Here's an article by Pete Johnson about Building Wild Wing combat planes. And here's a later article by Mike Bowns: How to Build a Wild Wing for Combat Flying. The other plane, the one with the "skunk cap" and a dark fuselage, is a modified version of a "Boomer". The Boomer was intended as a flight trainer, oddly enough. It starts with a Wild Wing then adds a fuselage and a different, rather fragile tail structure. Combat Boomers like this one dispense with the trail structure and a lot of the center of the wing. On my first outing with the Boomer, I tangled with someone's Wild Wing and ended up with the other plane's prop embedded in the Boomer. It counted as a "kill" -- the Boomer was still flying, the other plane wasn't. I left the prop fragment in for the rest of the session -- it was fairly firmly embedded, as you can see from the photo. The Boomer has flown with worse damage than that, though. The long nose is prone to breakage. One day, a hit on another plane broke the nose so that it was pointing 90° to the right. But nothing else was wrong, so I just kept flying. I wish I had a photo of that -- it looked remarkably strange, and the plane's flight characteristics weren't so good either with that big draggy nose hanging off to one side. No exposed hard or sharp parts. You will hit yourself or other pilots with the plane. EPP foam bounces off; wood keels or sharp metal rods don't. We even put little plastic beads on the exposed wire ends next to the servo horns. A lot of flying wing kits put the servos, motor and a bunch of structural reinforcement too far back, making the wing tail-heavy, and then you have to add a lot of nose weight and the plane ends up way too heavy. Don't just accept their design. 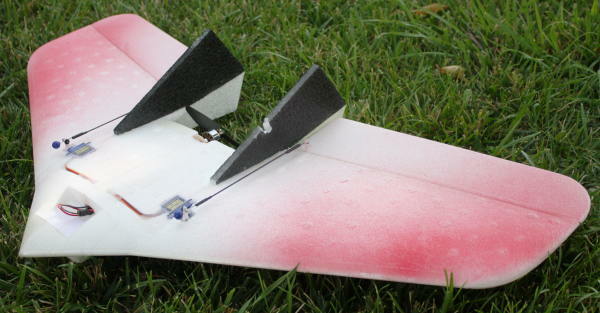 You can make your own servo cutouts farther forward on the wing, mount the motor as far forward as you can, and skip a lot of the extra reinforcement. 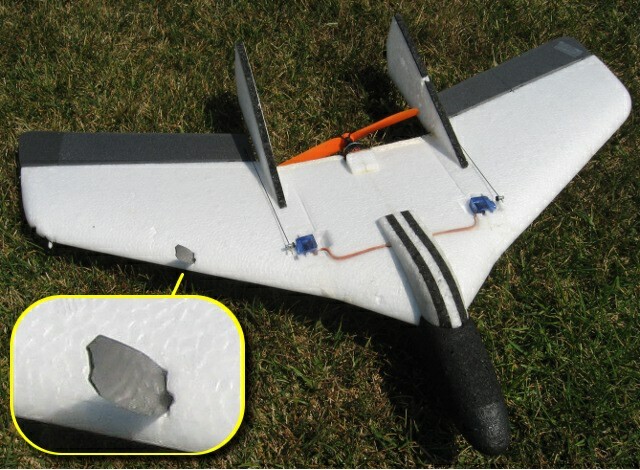 Many wing kits have the cutouts for the battery and electronics underneath. That's crazy! Remember, every time you land (unless you're very good at catching) you'll be skidding in on the belly. Don't risk your batteries and electronics: find a way to mount them on top. Contrasting colors are good (so you can tell which plane is which, and which side is up) but don't spend a lot of energy on your paint and graphics. 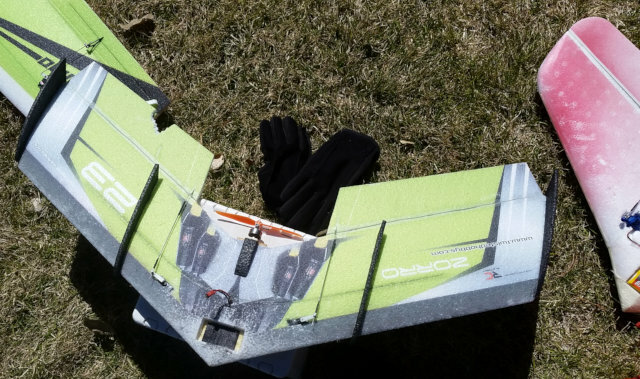 You will be taking the plane home in pieces sometimes and gluing it back together; just as often, you will be taping things back together at the field and flying it that way. Don't make it beautiful; then you'll get to the field and be afraid to fly it. After a hit, if your plane is still flying (as it will be about 3/4 of the time), do a roll to show you still have control. If you can't roll, then you "got shot down" and the other pilot "wins" that encounter. Not that anybody's keeping score. If your plane is damaged but you manage to roll it on the way to the ground, that's good enough. After most hits, both wings wobble or spin around in the air then fly off just fine. There's more discussion and a photo or two on the BayRC Boomer thread.